Sunday last the leaves rained down and I got carried away trying to capture it. Sunday night the Cubs lost to the Mets 4-1 after losing Saturday 4-2. Tuesday morning I happened upon this typewriter with my name on it. 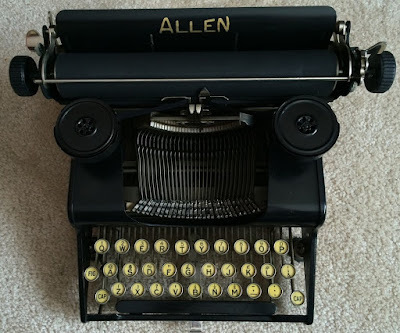 This is not the typewriter I will buy. I am thinking I might like the same typewriter I started with—no, not that really old typewriter of my dad’s that was all grey and green and bulky, always slightly musty and inky smelling, but my first typewriter, the one I got in high school that was all brown and yellow, a low-slung 1970s model. 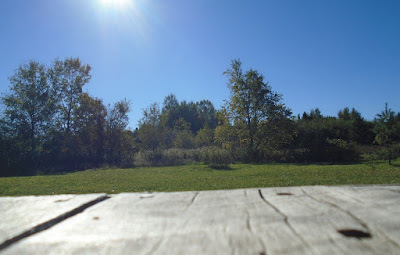 Then I got carried away with taking pictures from the middle of the cabin, I worked on an order for candles from the food co-op, I continued to mull over that winter project idea, and I enjoyed a visit from a friend that entailed skipping stones and root beer floats. 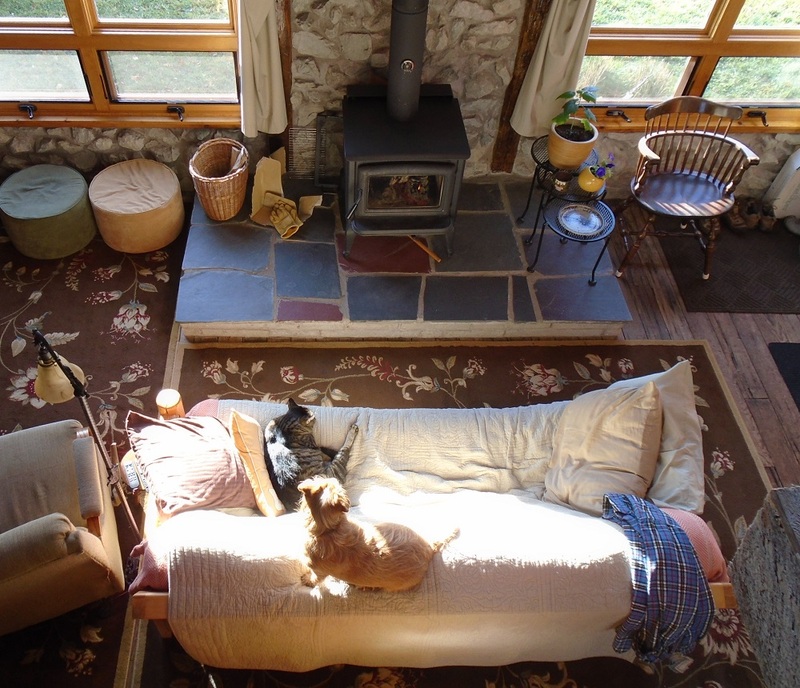 From the middle of the cabin. Wednesday, a beautiful day, really, and spending a part of the morning nosing around the Goodwill and Vinnie’s, looking for a typewriter, then at a bulk and natural foods and antiques place on Highway 41, still looking for a typewriter, but finding no typewriter, just a lamp I surely don’t need. I bring it home. Written in magic marker on a piece of masking tape stuck to the base of the lamp: WORKS. But the lamp doesn’t work. I pull away the felt from the bottom to see the wires and see they have been cut. Odd. Very odd. Now what? Attempt a rewiring project? Return the lamp? Forget about it? Stash it somewhere? It only cost two bucks, so who cares? Except for the fact of that piece of masking tape with the word “WORKS.” Seems the lamp ought to work. No, I don’t need the lamp, but I do have a spot for it. A nice spot. And the lamp makes me laugh. For now, its fate in limbo, the lamp will sit with its cord wound around its base on the kitchen counter by the tin with the dog biscuits. No, not the spot I had in mind. 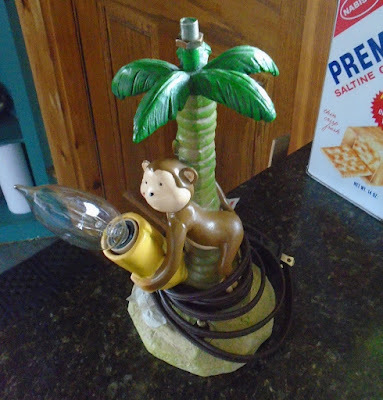 the lamp whose fate is in limbo. The Cubs lost 8-3. And there go the Mets, to the World Series. And that is the world, as we know it. Thursday finds me finishing up those candles for the co-op and getting into “Amphigorey,” a collection of stories by Edward Gorey. It was while on the morning walk with Josie that the image of Mr. Earbrass sitting on the floor in a snug room surrounded by scraps of paper, pieces of his novel, came to me, because I was thinking about this Winter Project Idea and how there is actually much to be done before the typewriter comes into play, and part of what needs to be done could find me sitting on the floor surrounded by scraps of paper. So, enter Mr. Earbrass. The sun, just rising above a low band of clouds, spilled across a field. Josie trotted on ahead. 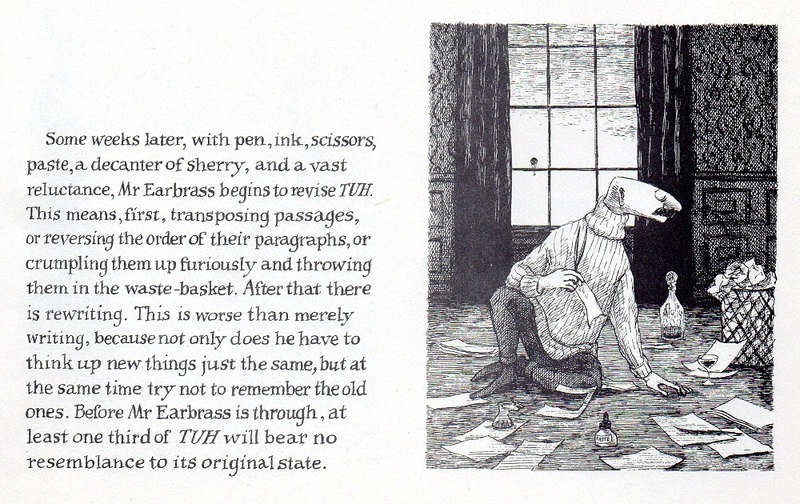 Later, I read “The Unstrung Harp; or, Mr Earbrass Writes a Novel” and laughed so hard I nearly choked. Also in “Amphigorey” one finds “The Hapless Child,” which is just about my favorite of all the Gorey stories. I have a signed hardback edition that a friend who once saw Edward Gorey in New York sent me, and that is the one I look at Thursday. In 1998, after the Cubs lost the National League Division Series to the Braves three games to none, my dad sent around an email with the subject line: Principles of Cubness 101. Now, reading “The Hapless Child,” I think how if I were teaching this course called Principles of Cubness 101, “The Hapless Child” would top the reading list, perhaps to be read in conjunction with “The Miraculous Journey of Edward Tulane.” Then, a fascinating roundtable discussion would ensue. By Friday I am noticing how the rustle of leaves underfoot has grown louder, I suppose because the leaves have dried considerably over the week. 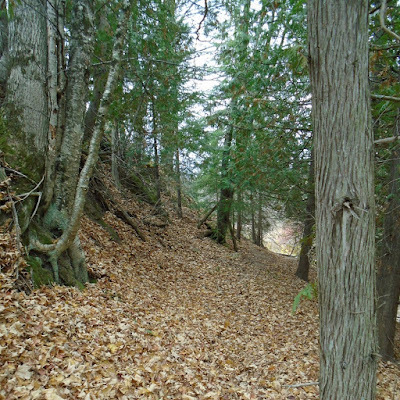 There is a loud crunch & rustle while walking that one part of the trail along the river that leads to the island, that part where all the maple leaves have fallen, remained, curled up, gone brown. Saturday, rain. The drive to the farmers market is dark and rainy and I stay behind a school bus for most of the way and wonder where the kids are going, what sport they are playing, will they win or lose, are they sleeping in the bus or talking to each other, or maybe they are plugged into iPods or myPhones or yourPhones whatever, and I remember that a new season of High School Bowl—that great academic challenge that pits one Upper Peninsula high school against another until a champion high school emerges—has probably started on the local PBS station and I should start watching, be chagrined when some youngster answers a question I cannot, and then be amazed (perhaps redeemed?) when all stare blankly at each other in response to some easy question about an old (but famous!) Broadway musical. Before leaving for the market I watched the ninth inning of the Royals v. Blue Jays, played the night before, and the Royals won, will face the Mets in the World Series, and summer is over, and seasons change, and the greatest change I have felt lately is this: no change at all. 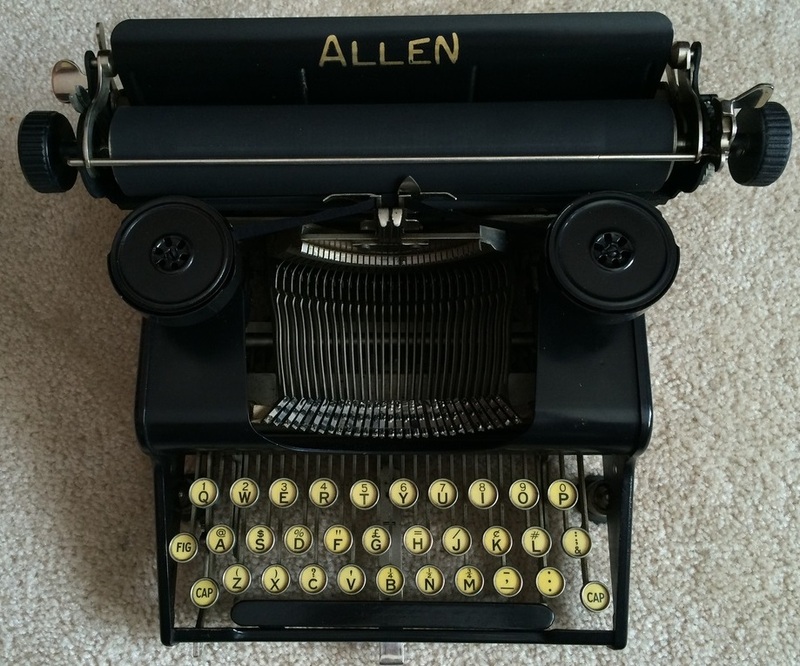 Except—I need a typewriter. it’s while walking the path to the river one damp grey morning that I smell the smell that reminds me of itself, of autumn, the damp dry leaves and the moist duff and the dry flowerheads cloaked in the morning’s mist, flowerheads still so full of seed – some spiky some fluffy – on brown brittle stalks that nod just a bit as I walk by, on the path through the meadow, surrounded this slate grey morning by views of summer now spent: shades of brown. Ahead trees rise to line the river, protect the river, shroud the river, and to get sucked in by the river during raging spring flows but now – those that have survived – rise with slick dark trunks to shake golden tassels, crimson locks, to dance and set free on a breeze golden leaves that loop and spin through the dim morning light, like sparks of light in the dawn, but it’s a predawn light, a light that exists before light is shed, a light that allows everything to be just what it is: twofold, binary, duplicitous, both darker and brighter, dry and damp, and I notice the smell of autumn because I can / I can pause and breathe and live / here / where I love. Walking down the drive toward the road (later), the drive of green grass (clipped) now littered with yellow drops of maple, curling, slightly, and the smell of the earth and the air and the trees and the leaves and the crumpled thimbleberries laced with blood-red vines; decay and the mushrooms that grow thick and rich / the smell is rich, chock-full, can be taken in so deeply, so fully, so full down, and I imagine sinking into it one day / if not now / and I know, after all, one day I will. – drop away, smell of earth and damp and dry and decay as all pieces of me melt and sink and rot and dry up and dissipate, rise up, get torn away, maybe carted off by eagles and crows and dropped, perhaps, in the mouths of babes and chipmunks – chipmunks who will gnaw at my bones and if this tickles I will laugh and you will see a light breeze move through the tall grass, the wanton weeds, and there I will be / but no more / except here / where I love. Of an afternoon I stand at a window and clouds scuttle by as there has been such a wind, a westerly wind, and the yellow leaves are lifted high and spun and twirled and dashed about with alternating partners of sky, grey sky and blue sky, dark day and light day, and the leaves just look like sparks and twinkles and magic carpet rides dancing my way, any way they are blown, and the clouds are dark and they try to look threatening, to scare – oh my! – but they get pushed away by this trickster wind as the sun plays and plays / here / where I love. How I used to love being in Wrigley Field in the front row of the centerfield bleachers where the park, the game, the fans, the crowd, the weather stretched out before one on a lazy afternoon of limitless time and the trains rumbled by just behind. Part of the feeling watching Tuesday night as the Cubs beat the Cardinals to advance to the National League Championship Series was this immense happiness for Wrigley Field, a dear old friend. 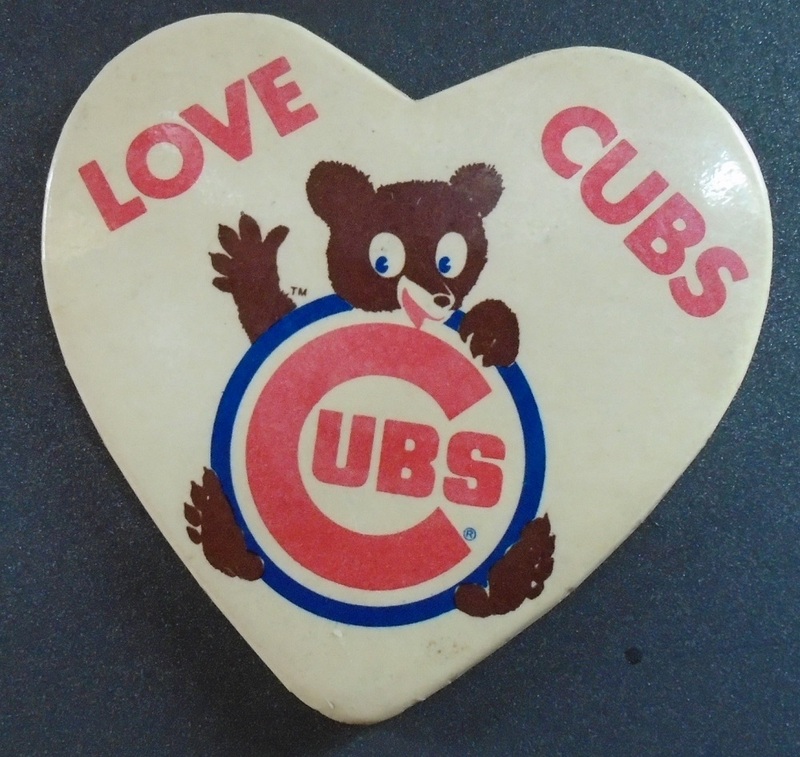 Some like to call Cub fans “long-suffering” – Bah! The amount of time I have spent enjoying being a Cub fan far outweighs any suffering. And now! Now! 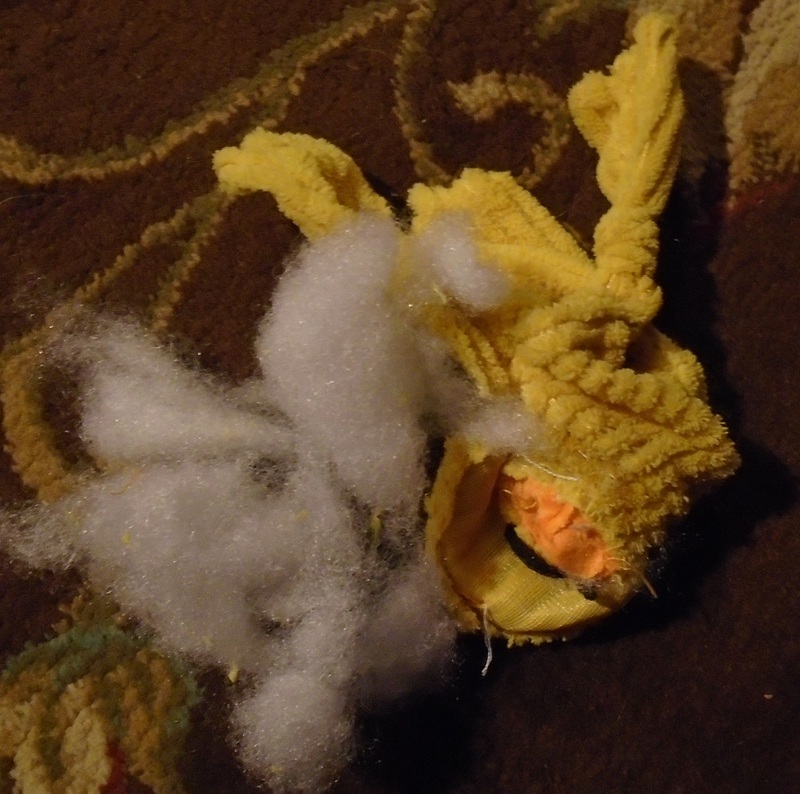 We are enjoying this moment of winning, and with the face ripped off the Pirate Voodoo Doll Dog Toy and the stuffing pulled out of the Redbird Voodoo Doll Dog Toy, it is time for … (drum roll) (please) (ta da!) 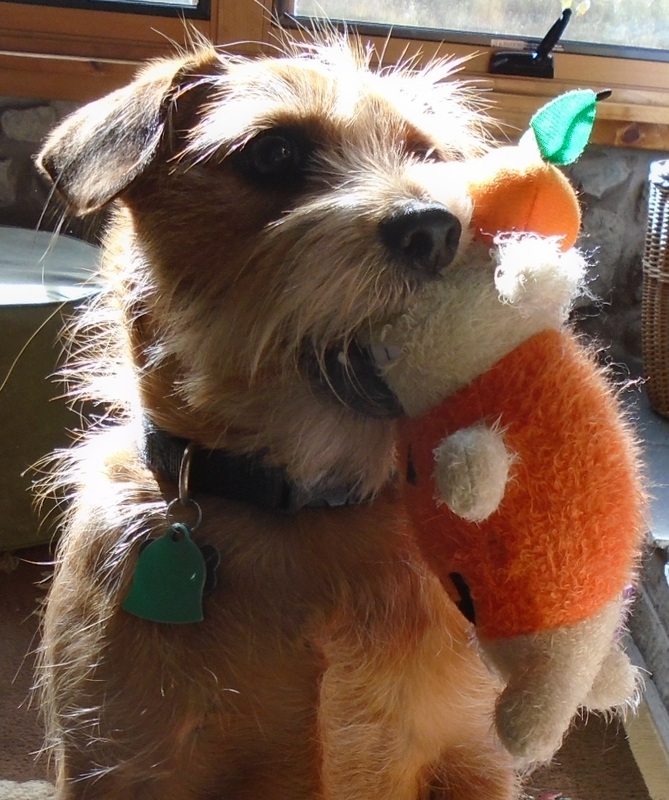 … Quackers, the Mets Shmets Just Ducky Voodoo Doll Dog Toy! Have at it, Josie, and may we all have a bit of fun on our way to victory (for some) and defeat (for some). Oh. I see Josie’s already had at it with Quackers. 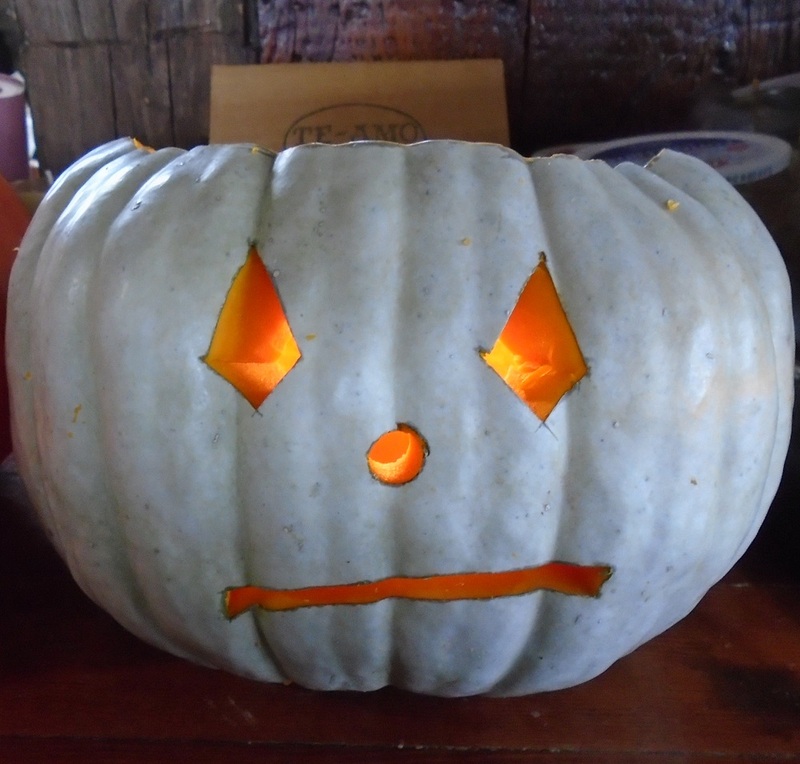 pumpkin boy voodoo pirate doll, plus, a video lesson in border patrol: autumn! and the cubs are still playing! 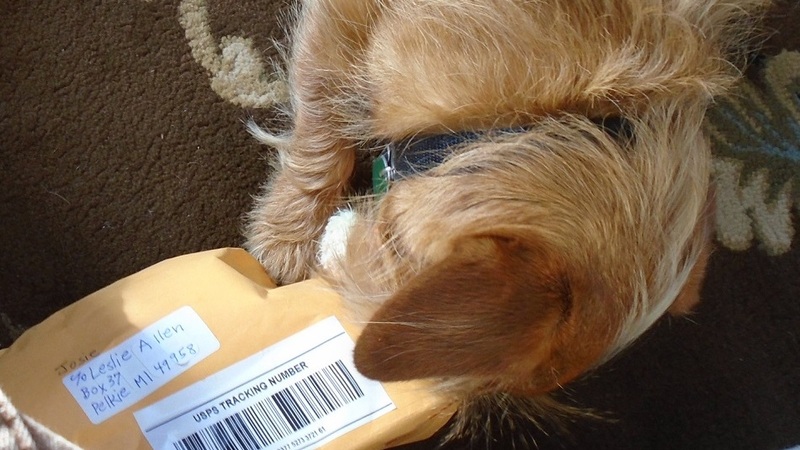 The other day a package arrived for Josie. It came through the U.S. mail from far away. 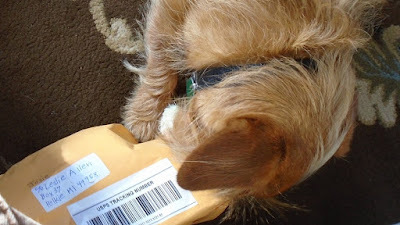 It was a squooshy envelope addressed to Josie in care of me, so I cut off the end of the envelope and Josie took it from there. 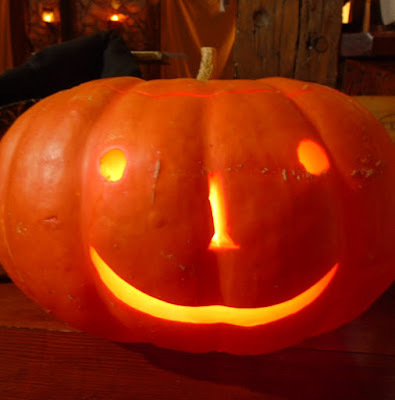 He pulled out Pumpkin Boy. Squeezing Pumpkin Boy’s head made him squeak. Very exciting! And, if chewing him just right in just the right places, a little stuffing came out! What a lovely gift! Josie asked me to please write a thank-you note to the sender, so I sat down to do just that. Then, out on the porch there arose such a clatter, we had to to get up to see what was the matter. There was Elliott and a chipmunk. 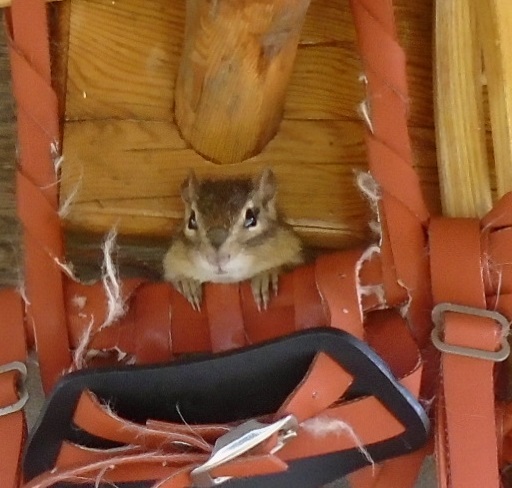 Chippie ran up the side of the cabin straight to the snowshoes hanging by the door. There he took refuge. Josie was pretty excited. I herded him back inside. Elliott disappeared under the porch. But soon he emerged, and I lugged him inside. Chippie remained in the snowshoe. 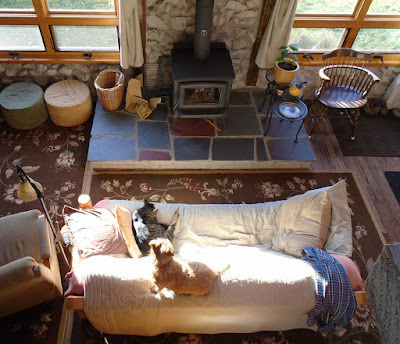 Elliott fell asleep on the sofa, but Josie stayed full of thoughts of that chippie in the snowshoe. 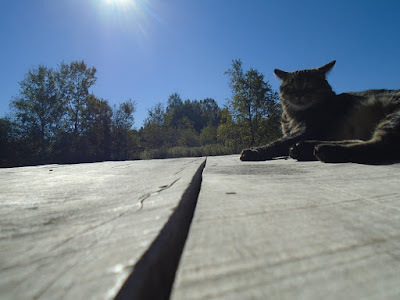 Not as wild and anxious as he is sometimes, like when the ungulates are advancing on the cabin from the west, munching their way slowly into our territory, but still he was keen to get back out, so out we went. 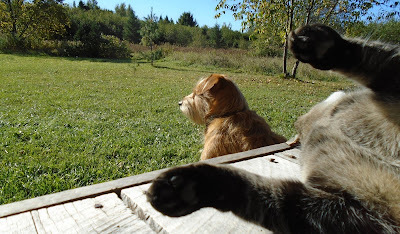 Chippie was still in the snowshoe. Suddenly, he dashed to the top of the head of the kitchen window! And there he hung out the rest of the day. I brought Josie in, and he and Pumpkin Boy settled down for a nap. I finally sent that thank-you note. In return, I got the story behind Pumpkin Boy, which began with an idea to send Josie a pirate toy to maul in preparation for Major League Baseball’s National League Wild Card Game, a game featuring the Chicago Cubs and the Pittsburgh Pirates. But no Pirate dog toy could be found, so Pumpkin Boy was put in the game, and he was a fine voodoo pinch-hitter indeed. 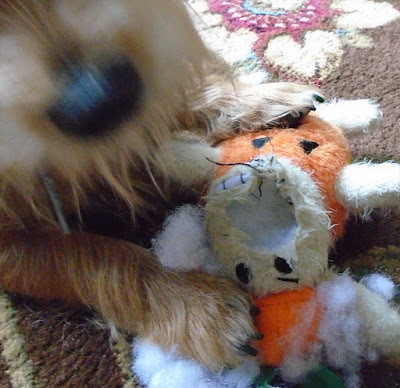 No remorse was felt when Josie tore Pumpkin Boy’s face off, dispensed with the squeaker, tossed those big fluffs of stuffing here and there, because this is exactly what we wanted to see done to the Pirates in the Wild Card game. Once we were done with the Pirates, we could go looking for a stuffed squeaky Cardinal, let Josie have at that, make it squawk! Tear it open! Rip that squeak-squeak right out of its beak! Then, we’ll go find a Dodger or a Met … but what the heck is a “dodger”? A guy dodging a trolley car to get to Ebbets Field, if I remember correctly. But in LA they just dodge traffic … would a squeaky car do? Nah. How about the Artful Dodger, from the musical “Oliver”? Davy Jones, later of Monkees fame, played the Artful Dodger on Broadway. Aha! Should be easy enough to find a squeaky monkey voodoo doll … But, what if it’s the Mets? What the heck is a “met”? Short for “metropolitans,” I believe. But, what’s a “metropolitan”? A city slicker? An opera singer? Maybe I could find a squeaky, furry opera singer. Or a squeaky, furry guy in a business suit with skinny black tie. Then, oh my gosh, what would we do for an “astro”? That dog from The Jetsons? Or an astronaut? But, if it’s the Royals—Prince Charles? Queen Elizabeth? Are there any stuffed and fuzzy Texas Rangers out there? A blue jay! That would be easy! There’s some out in the yard right now. We’ll leave the Blue Jays to Elliott! But, we get ahead of ourselves, don’t we. 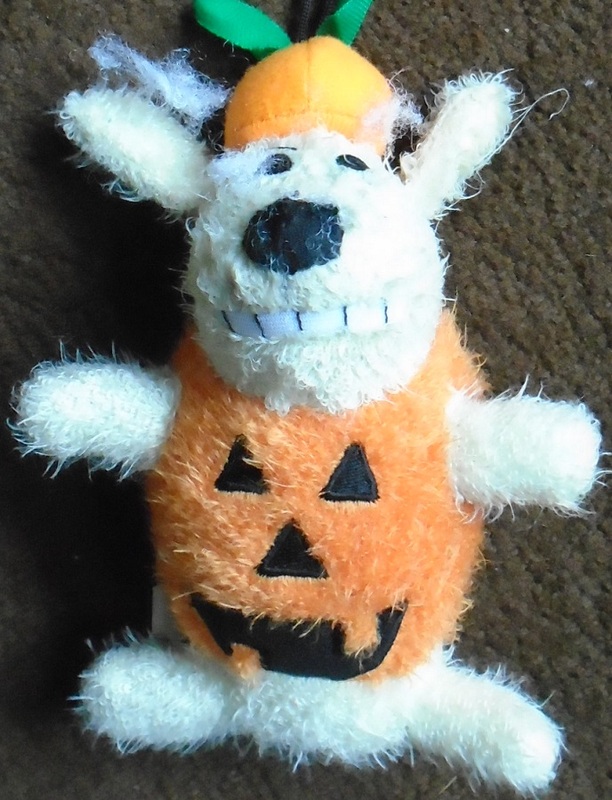 One voodoo doll dog toy at a time, please. 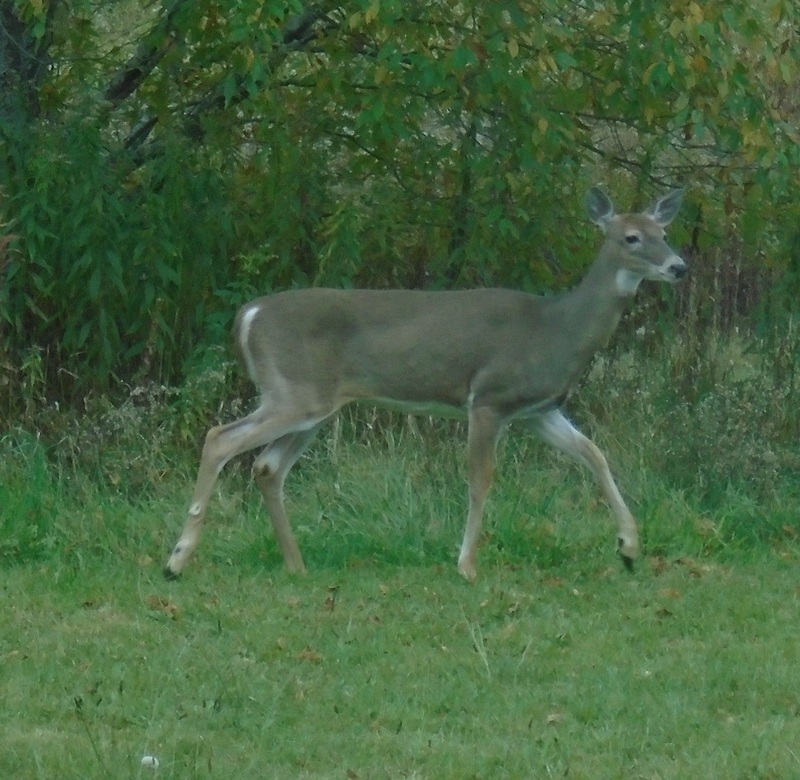 Later that same day deer came through the yard. 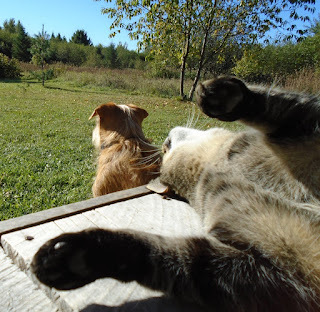 Josie was still sacked out with Voodoo Pumpkin Doll so he didn’t see, but Elliott was out there, and one deer did that thing of staring at him for a very long time, stamping one hoof then another before tiring, or having made his point, and wandering off. This deer needs one of those bubbles over his head that says: Dumb cat. On Wednesday the Cubs did take the stuffing out of the Pirates. Now it’s time to do the same to those Redbirds. 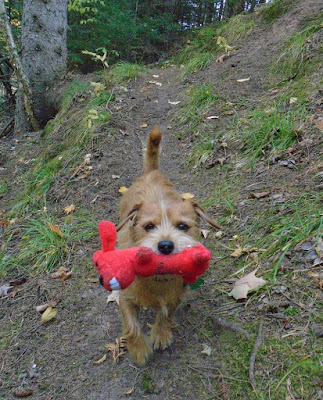 Redbird Voodoo Dog Toy is destined for the river. 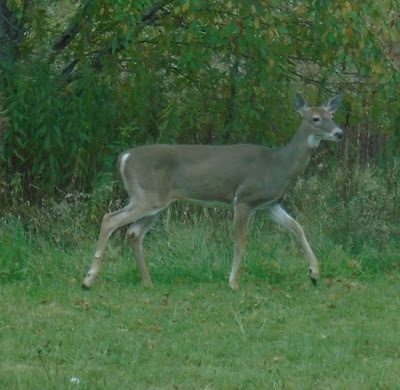 Meanwhile, autumn has turned on her colors and more and more deer pass through, apparently unafraid of Josie. Nonetheless, we feel sure our borders are secure.